Protests against the interim order not to make aadhaar cards mandatory for availing benefits of various government sponsored welfare schemes continued with the RBI and SEBI, along with the governments of Gujarat and Jharkhand today seeking clarifications and modifications from the Supreme Court on it. A bench of Justices J Chelameswar, S A Bobde and C Nagappan agreed to hear the pleas on October 6. But it raised the question whether it can entertain such interim applications after transferring the main petitions to a constitution bench to decide issues like right to privacy. The question raised is this: Can we deal with it after referring the matters to constitution bench, the court asked. The RBI sought clarification as to whether an account can be opened in a bank on the basis of the Aadhaar card for providing the benefit of pension or for getting paid for MNREGA. SEBI wanted to use the Aadhaar cards in the securities market to know whether the persons were active in the markets. Raising issues similar to the RBI, Jharkhand, in its plea, today sought to use Aadhaar cards in payments of pension and seek a declaration from pensioners that they are alive. Similarly, Gujarat also wanted to use these cards to identify target beneficiaries of its welfare schemes. The Supreme Court had earlier said that Aadhaar card will not be mandatory for availing benefits of welfare schemes. It had however also said that authorities may use Aadhaar cards in PDS scheme and in particular for the purpose of distribution of food grains, etc and cooking fuel, such as kerosene. The Aadhaar card may also be used for the purpose of the LPG Distribution Scheme. Senior advocate Harish Salve, appearing for Gujarat, said that people are free to live wherever they want, but the government will have to find ways to identify target groups or persons for extending benefits of the welfare schemes. If I have to identify the persons for granting benefits, I will have to find some ways to do so, he said, adding that the Government, as trustee of public funds, needs to identify target beneficiaries. The court has now asked the two states, RBI and SEBI to serve copies of their pleas to the petitioners who have challenged the constitutional validity of the Aadhaar card scheme. It is to be noted that the court had in August directed Modi government to ensure that personal information of card holders is not shared with any other person or authority. The government has also been directed to ensure that the cards are not made mandatory for citizens to avail any benefit. However, in partial relief to the Centre, it allowed linking the cards with the public distribution system for distribution of food grains, cooking fuels and LPG cylinders. "There is merit in the complaints. You are unwittingly allowing snooping, harassment and commercial exploitation. The information about an individual obtained by the UIDAI while issuing an Aadhaar card shall not be used for any other purpose, save as above, except as may be directed by a court for the purpose of criminal investigation," a three judge bench headed by Justice J Chelameswar said in an interim order. Taking serious note of violations by central and state officials in continuing to insist on aadhaar cards for distributing social benefit schemes, the court said, "Union of India shall give wide publicity in the electronic and print media, including radio and television networks that it is not mandatory for a citizen to obtain an Aadhaar card. The production of an Aadhaar card will not be a condition for obtaining any benefits otherwise due to a citizen." 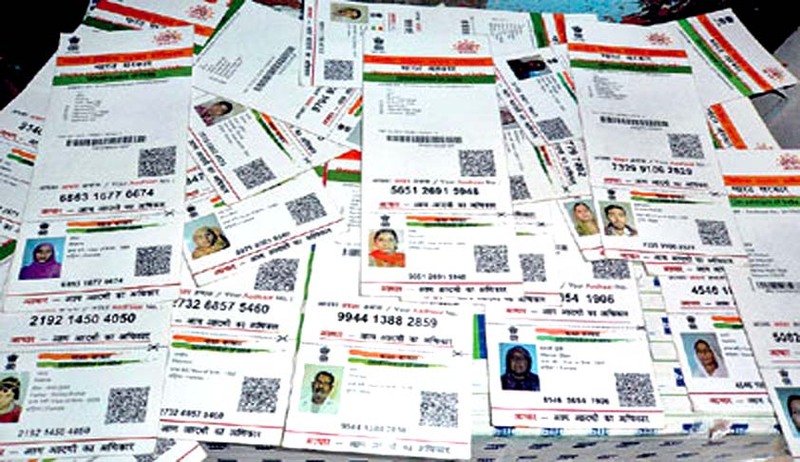 The direction comes at a time when petitioners before the Supreme Court are seeking the destruction of all personal information and details stored in the UIDAI's database, to prevent abuse. They contend that biometric identification denoted for UID, namely the iris scan, finger print identification, and the personal details collected by unknown agencies on behalf of the UIDAI, can easily be misused by a miscreant. Read more news about Aadhaar Case here.